Berlin. One of my favourite European cities. Probably my second favourite overall after Lisbon in Portugal. It’s one of those places where you sense the friendly party atmosphere and feel alive at night. And it’s a very cool place to go. It wasn’t my first visit as I’d been here during a whirlwind Contiki tour one year ago. Only catching a quick glimpse of the city which was enough to make me vow to return again. The first night I arrived was a public holiday celebrating Day of German Unity. Meaning that there was a wee festival in the Brandenburg Gate area for me to check out. I discovered this night that Germany does indeed have delicious fruit beers beginning the start of a beer-drinking frenzy for the duration of my Germany trip. Over the next few days I checked out the old usual tourist sites including places like the Berlin Wall East Side Gallery, Topography of Terror, Checkpoint Charlie and the Holocaust museum. And a bunch of graffiti street art. For another day I hired a bicycle and rode around Berlin. This was definitely a great idea. Everywhere in Berlin it’s easy to spot bike rental shops for really reasonable prices. I paid a mere €10 for 24 hours for a decent bicycle with a comfy seat. There are cycle lanes absolutely everywhere making it an easy healthy option to get around. I never once felt unsafe from the traffic while riding. I dedicated the day to visiting parks. And then of course there was the night-life. I did a couple of different pub crawls while in Berlin. One with Sandemans which was okay. The group of people attending was far too big and the tour went to bars that were generally empty on our arrival. But the second one was excellent with the Berlin Alternative Tours company and I highly highly recommend. I also did a free walking tour with this company which was equally amazing. I just wish I’d had more time to do more of their tours. I wanted to stay in Berlin for longer. I can honestly say I had the best time during my four days. Seeing and experiencing so much more compared to my last visit was a glorious feeling. And realising this city I still liked this city just as much as the first time. But I had to move on with only having a limited time in Germany to travel. I felt it would be good to see more than just two German cities. Plus I was finding that with the exciting night life, and my noisy dorm room, my sleep wasn’t that great. If I continued on I would have worn myself out with exhaustion which I didn’t want. So a little bit hungover the next day, I headed to the bus station to head on southwards. Overall: I booked this hostel through Airbnb as it was strangely cheaper on there than Hostelworld. Never hurts to compare guys! It was a cool hostel. Probably more of a party one though as my room mates were coming in at all hours from their various night time activities. There is a friendly bar on the bottom floor with some interesting decorations as per below photo. The breakfast is one of the best hostel ones I’ve ever had. Just simple but exactly what I craved with fresh baked rolls, yoghurt and muesli etc. The neighbourhood looks dodgy initially as there is graffiti absolutely everywhere, but that’s normal for that part of town and I felt safe walking around at night. The hostel itself is a mixture of groungy and modern. Just depends on the part your room is located. I felt happy enough staying there. I heard whispers of a magical place north of Athens in Central Greece. Mainly from other travellers like Shelley and my favourite travel bloggers that I follow. Other travellers in the islands hadn’t heard of Meteora before. But that’s because they were beach bum travellers only interested in places with sunshine and sand. Rather than wanting to see the true beauty and culture of Greece. You know the kind I mean. Before I knew it, I was on a bus heading north to a small town called Trikala. I knew I would like Trikala immediately as the directions to my hostel started with: Look for the peeing boy foundation in the central square. Who couldn’t be amused by that? I got to Trikala and settled in with a bit of a wandering walk. I went to the local zoo which contained chickens, goats and llamas. More of a farm really. But then on the way back, I found a hillside filled with tortoises. Must be a Greek thing to have so many running about? I went to bed that night feeling rather excited about my plans for the next day in Meteora. When heading to Meteora, you can stay in closer town called Kalambaka which is right at the bottom of the famous Meteora rocks. Trikala is further away with a fifteen minute bus ride required, but much less touristy and considerably cheaper. My Trikala hostel was also particularly awesome which made the extra €3 bus ride worth it to me. And now I guess you’re wondering what all the fuss about Meteora is about. Well it’s a UNESCO site consisting of six different monasteries built on top of tall isolated rock pinnacles. It is insanely beautiful and moving to see. You can visit the sites by bus tour, or catching another bus from Kalambaka to the top, but I decided to do it by hiking. A harder option of course but I wanted that sweaty sense of achievement and satisfaction when I reached the top on just my two little feet. Image from flickr.com, this is the fantastic map my hostel gave me. I was very impressed with the amount of detail! It only took me about one hour to walk the distance of 6 kilometres and 366 metres elevation from the Kalambaka bus stop to the Great Metero monastery. Definitely very achievable and special. I could see my target in the distance! My feet were pretty darn sore by the end of that day. Almost nubs after a good six hours walking. I also don’t want to think about how I smelled after so much hiking and heat. But I do know I felt amazing after my shower that night. It was one of those showers where you feel re-born and actually human again afterwards. That shower was certainly counted in one of my top five showers of all-time. I strongly suggest hiking the whole way. It may look daunting from the bottom but is most definitely achievable. The sense of achievement is quite spiritual and satisfying. There is a great trail to get up to the Great Metero Monastery from the road which is shaded and pretty. It is unmarked, but also the only trail so hard to miss. On the return to Kalambaka, I used another good trail from the St. Nicholas Anapausas Monastery which was cleared marked with a Kalambaka sign. Don’t worry too much about wearing trousers as the monasteries provide wrap-around knee-length skirts to make you ‘decent’. You do need to wear something that covers your shoulders though. Also try not to think about how many other sweaty strangers have also worn that skirt that day. It does cost €3 to enter each monasteries. I only had €10 cash with me which limited the number I could visit. No ATMs or eftpos up on those remote rock pinnacles. There are snack stands by the Varlaam monastery with the usual crap tourist food and souvenirs. I suggest stopping by a bakery in Kalambaka to stock up on tasty snacks. Water is a great idea.. But don’t feel you have to bring a massive bottle. There are water taps in the monasteries. Be aware that all the tour buses full of tourists seem to arrive at lunchtime causing massive queues. They were all gone by two-ish and only visit the two biggest monasteries. Overall: Excellent hostel. I would highly recommend. 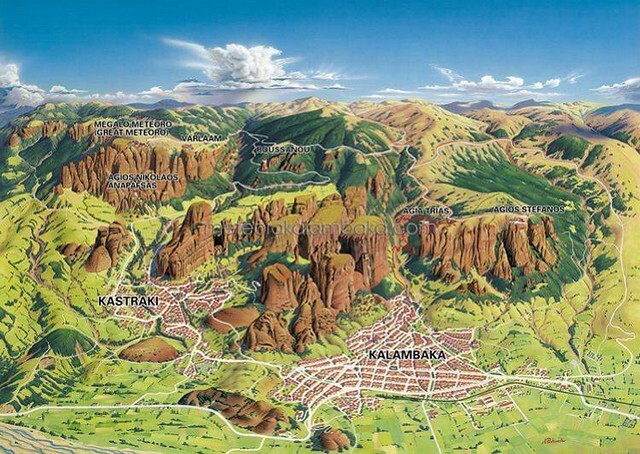 The staff give you a brilliant map of Meteora and talk you through all the steps of visiting it. I only decided to hike the whole thing after feeling so inspired by their speech and reassurance that it was indeed very doable. 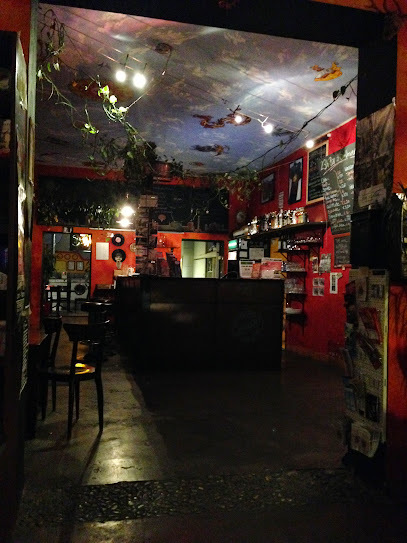 The hostel itself is clean and tidy with a great cozy atmosphere.